Spotify is introducing a new cloud-based feature for premium subscribers designed to make it easy to start to play music on your mobile device, then push the stream to wireless home speakers, which will continue rocking even if you wander away with your phone—similar to the way Google's Chromecast works. 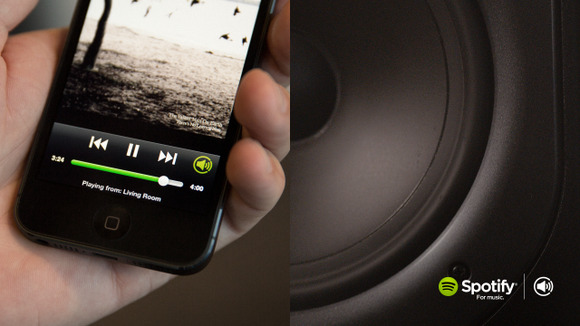 Called Spotify Connect, the new service is rolling out over the next few months to iOS devices as well as home audio systems from companies such as Argon, Bang & Olufsen, Denon, Hama, Marantz, Philips, Pioneer, Revo, Teufel, and Yamaha. Think of Spotify Connect as a remote control for Spotify—a remote that lets you switch quickly between devices. You can, for example, start listening to a playlist on your iPhone, and then when you get home switch to listening on your home stereo or iPad. The list of audio manufacturers pledged to support Spotify Connect. That may sound a lot like other services that let you share data and files between devices, such as Miracast or Apple’s AirPlay functionality. But instead of streaming music from your iPhone directly to a pair of speakers, Connect streams the music directly from Spotify's servers. The company says its approach will help users save on battery life as well as cut down on interruptions to your Metallica listening sessions from phone calls or notification alerts. When Spotify Connect lands on your device, you should see a green speaker icon next to the play controls inside the Spotify app. Tap it and a menu comes up with all the various devices that can receive your playlist—all devices must be logged in to the same account for Connect to work. Spotify Connect is aimed at encouraging more users to pay $10 per month for Spotify instead of freeloading with the ad-supported service. In addition to Connect, Premium subscribers also get full access to their Spotify playlists on mobile devices (free users can only use the radio feature) and ad-free listening. Spotify Connect certainly sounds interesting—assuming the audio manufacturers indeed release hardware to support it—but it will also be a fairly exclusive addition out of the gate. Connect will also be absent from Android and PC desktops at first, with plans to add the new service to these platforms at a later date. Spotify did not specify exactly when Android users can expect to see Connect on their devices. Also, while the roster of companies supporting Spotify Connect is vast, one notable audio hardware maker missing from that list is wireless system maker Sonos. Spotify wouldn’t comment on whether Sonos is coming, but Spotify did say that more hardware makers will be added in the future. Spotify has certainly been busy this summer. Earlier this year, the service also released a number of new music discovery tools, includingBrowse and Discover.